CARLSBAD — Over the next 15 years, city officials plan to spend $496 million on 258 new and continuing projects in the city, according to Public Works Director Patrick Thomas. Thomas presented city council with the Capital Improvement Program at a meeting on Tuesday. All of the projects are driven by growth in the city and the need to replace or enhance existing facilities, according to Thomas. He described the myriad of projects that are either planned or underway. All of the street signs in Carlsbad will be replaced over the next year to comply with new reflectivity laws. Kristina Ray, community relations manager for the city, said they’re also considering changing the signs from green to blue but haven’t finalized anything yet. The traffic department is also looking into making the traffic signals more efficient. Thomas said they’re looking at installing an adaptive control system into the signals along major arterial roads to ease traffic. Recently, a central control system was put in place to control traffic lights from a single location. “We now have communications to all of our traffic signals throughout the city so we can actually access the traffic signals and make adjustments in their timing, if necessary, from a central location,” Thomas said. Another traffic project is the widening of El Camino Real. Over the next 12 to 16 months, the road will be widened to three lanes in each direction. Construction crews will also put in a raised landscaped median to separate traffic. Staff is also working on projects on Carlsbad Boulevard. Thomas said they’re applying for a grant from the San Diego Association of Governments to improve the pedestrian crossing at the entrance to the state parking lot next to Tamarack Beach. He hopes construction will be underway on the project later this year. Within the utilities department in the city, a $60 million project will begin later this year to reconstruct the Agua Hedionda Lift Station and add pipeline to the Vista-Carlsbad Interceptor. Reclaimed water pipelines will be added next to sewage lines which run to the north. Vista will pay for 2/3 of the project because the city owns 2/3 of the pipeline. The reclaimed water treatment plant will also be expanded to go from producing 4 million gallons a day to producing 7 million gallons a day, according to Thomas. “The amount of wastewater the city of Carlsbad generates is between 11 million and 12 million gallons a day so with this expansion, we’ll be able to reclaim over half the wastewater generated in the city,” Thomas said. The city currently has 70 miles of reclaimed water pipeline. 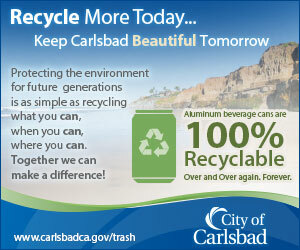 He compared Carlsbad’s reclaimed water system to the city of San Diego’s. Other projects that are on the horizon include additions to Aviara, Pine Avenue and Poinsettia Community Parks, and the remodel of the Dove Library. The city is also working with SANDAG to study the possibility of trenching the train tracks in Carlsbad Village. In doing so, pedestrians and traffic would no longer be forced to wait at railroad traffic and city safety would improve. The funds for the improvements come from developer fees, water and wastewater funds, and infrastructure replacement funds, which are essentially the general fund, and from outside agencies like gas taxes, Thomas said. A small portion also comes from financing mechanisms.